I have always loved Dr. Seuss! As a child and even a teenager, I was drawn to the wackiness of his themes and made-up words juxtaposed with the reason of his perfect prose. As I’ve studied early education and early literacy, I’ve come to love Dr. Seuss even more! His books are pretty much the best for building phonological awareness, the development of which is critical for reading (read more here). They not only expose children to rhythm and rhyme in an enchanting, almost intoxicating way, but they also introduce rhyming with invented words, which emphasizes further the importance of sound in rhyming – not meaning. These “nonsense words” also open the imagination and creativity of children in a simply magical way. In my opinion, his work is so critical to a good education, I refer to him as the Shakespeare of childhood! 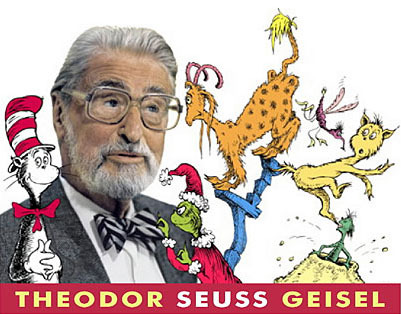 Dr. Seuss (born Theodor Geisel) was a pioneer on the front of children’s literature. His first children’s book, And to Think that I Saw it on Mulberry Street, came about when he couldn’t get the rhythm of a ship’s engine out of his head. He took that pervasive beat and used it as the meter for his prose in this somewhat reflective look at his childhood. It took some time to get published, but established him as a quality children’s author. His most famous work, The Cat in the Hat, came about as a response to the claim that basal readers for children were too staid and boring, and that children were not developing as readers because the material they were given in school was not enticing enough. Using the same required 250 word list, The Cat in the Hat turned basals on their heads. Almost literally! The book seemed too radical to some in the education profession, but parents and children couldn’t get enough! Another early reader favorite, Green Eggs and Ham, actually came about as the result of a wager! A publishing friend bet Ted that he couldn’t write a book using only 50 words. He did, and decades later children still can’t stop reading it! Dr. Seuss was prolific and amazing, and he changed the face of children’s literature forever! If you’re a Seuss-ophile like I am, check out the biography Dr. Seuss and Mr. Geisel by Judith Morgan and Neil Morgan, it’s fascinating! You can also read a summarized biography as well as check out some great activities and quotes at the Seussville website. So in honor of Dr. Seuss’ 106th birthday, I’m posting some of my favorite Dr. Seuss Book Activities! Top image from Newark Library.